April 4, 2019--A few years ago (3 to be exact), I wrote about a storage solution for my needlepoint thingies (see below) and for the most part, was satisfied with the arrangement. Recently I exchanged chairs with my husband (a back issue)--me getting the LZB Rocker/Recliner and he getting the LZB Loveseat/Recliner. Not having the seat next to me for placement of my little blue plastic storage container, I tried placing said container on an old wicker side table. Didn't like this at all. So I began shopping on the Facebook Market Page using the key words "Side Table Sewing" and came across lots of listings for something called Martha Washington's Sewing Cabinet. From what I understand, these functional units were manufactured around the 1930s (depression era) and were a hit. No one wants them now and they are available everywhere (found 10 within a 30 mile radius of my home in Delaware). So here it is in my living room next to my Happy Chair. Love the increased amount of storage and the two baskets on each end will be great to house my knitting. We call this our Living Room, and we most certainly do live in it. January 18, 2016--I've been browsing through storage container and craft stores to find something that has a few small but deep drawers on the bottom, and a larger drawer or space on top to hold my needlepoint tools and other stuff needed for stitching (including eyeglass cleaner, hand cream, etc.). 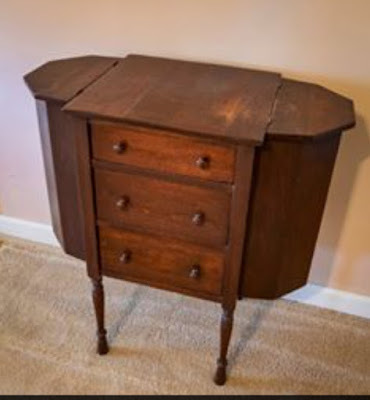 Maybe even something like a very large jewelry box. This is to clean up the mess that resides to the right of me on my loveseat. When I told DH about my dilemma, he said wait--I may have just the thing in the garage that would work. And lo and behold he did and it works perfectly. It's not pretty, but will be very easy to move into another room when we have guests. Now compare this picture with the one further down from November's posting. PS The recliner is in the up position so you can see how easily my K's Creations floor stand can be maneuvered to where I stitch. 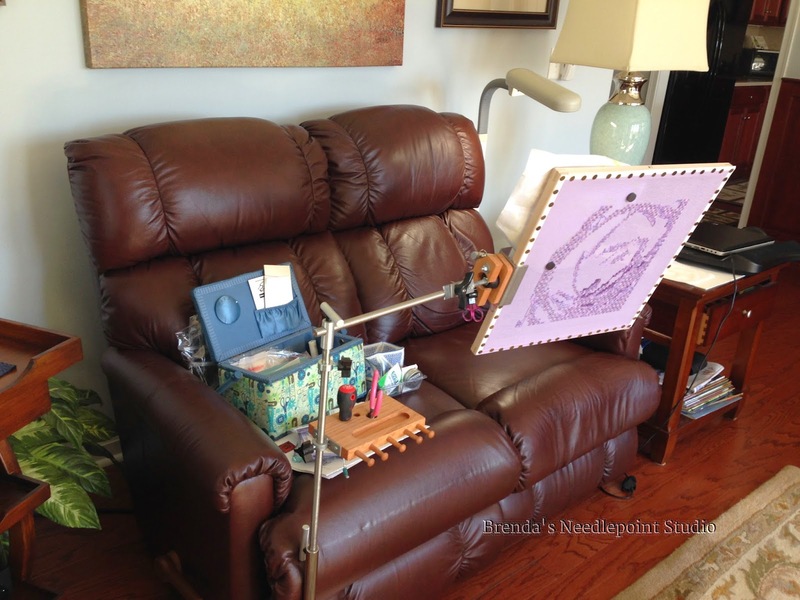 November 10, 2014--I love seeing pictures of needlepoint nooks, happy chairs, etc. that many bloggers write about, so I thought I'd say something about mine. My stitching haunt is on a leather love seat/recliner located in my living room. Here I can happily stitch while keeping DH company, watch television, look out through the windows unto our lovely back yard and gardens; plug myself in to listen to audio books; make telephone calls, etc., etc., etc. As you can see, I have the required floor stand (a K's Creation); an Ott floor lamp; a side table to hold my PC, iPad and iPhone; needlepoint magazines and reference books; and a basket and bin next to me on the love seat to hold my various needlepoint accouterments. However, these days I'm more on the road than in my chair, so it is calling to me. Soon, soon, I'll be ensconced in my favorite seat working on my favorite past time.